Surgery is your only option! That's what Ginger's family was told. When they told their regular veterinarian about their interest in seeking a referral to the Animal Pain Management Center, they were surprised to hear that their veterinarian refused to actively participate in any referral to any practice that might perform acupuncture; a discipline that the veterinarian could not accept or embrace. 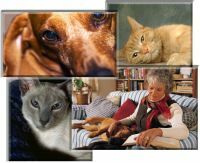 The referring veterinarian didn't know that pain management services such as the one at the world reknown Cleveleland Clinic Pain Management Department consider acupuncture one of their critical core patient management services. Interestingly, when we first saw Ginger, we didn't perform acupuncture at all. At presentation, Ginger was exquisitely painful when touched over her back and even when touched lightly over her left hind leg (a condition called allodynia, where innocent sensations like the brush of your clothes against your skin can be extremely painful). Ginger's diagnosis was intervertebral disk disease (IVDD) with peripheral neuropathy (like sciatica). We recommended advanced neuropathic pain medications in conjunction with acupuncture therapy. In addition, we set the withdrawal of all cortisone therapy as a short term goal. Ginger's family accepted our medication recommendations but they initially declined acupuncture due to the fact that it would require repeated sessions. 10 days into her expanded pain medication program Ginger was no more than 10% better. She was 3 weeks into her pain episode and she was not showing adequate progress. At this point, we recommended that Ginger be hospitalized for an intravenous pain medication infusion plus an epidural injection to concentrated pain relieving medication at the spinal level to be followed by several acupuncture therapy sessions. Ginger's family declined the inhospital medication therapies but agreed to a series of electroacupuncture therapy sessions. 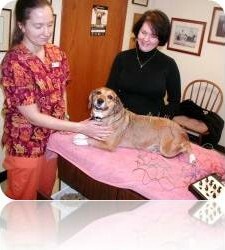 The evening of her first electroacupuncture session, Ginger was a new dog; her pain was a fraction of what it had been prior to acupuncture. By the 4th day, the family thought she was entirely pain free. Ginger continued her interdisciplinary management program (multimodal allopathic neuropathic pain medications combined with acupuncture therapy) over a sevreral week period but was eventually weaned off of all medications. As of February, 2011, we are now 4 years down the road and Ginger has never had a reoccurance of her back pain. While many IVDD back patients are best served by surgical intervention, many families cannot follow that path. In addition, many patients simply do not qualify as surgical candidates. When steroids and NSAIDs are failing to effect immediate relief, advanced neuropathic pain medications, acupuncture, and physical rehabilitaion therapy should be considered as the immediate next step without delay!